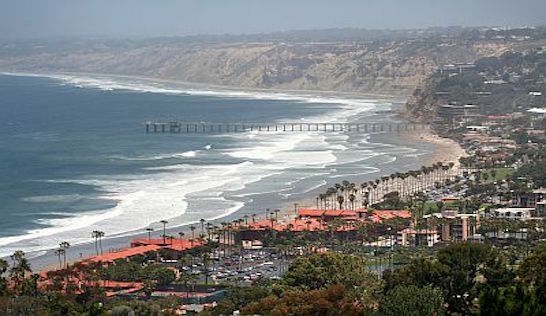 One of the ultimate beach runs is from La Jolla Shores to Torrey Pines. Big wide beach, towering cliffs over head, crashing waves, seamless firm sand, sunsets….it doesn’t get better than this. It’s 5 miles one way from La Jolla shores to Torrey Pines State Beach. Shorter options are possible using the path to La Jolla Farms Rd. or Gilder Port. It’s also possible to extend the run north to Del Mar. Running on a beach is, if course, situational. Plan on doing this run during low tide, where the sand is more firmly packed. At Scripps Pier there are beautiful tide pools but it’s a bit rocky. Black’s Beach, closer to Torrey Pines, is ‘clothing optional’. At Flat Rock, a narrow trail allows you to negotiate the area. La Jolla Shores Beach or Torrey Pines State Beach.